There was a time -- not long ago -- when I thought of a taco as a regional specialty. More than that: something regional to be eaten only at a fast food place. In fact, when I was f irst sprung the idea of writing about 300 Best Taco Recipes (Robert Rose) I scoffed. Three hundred recipes for tacos. Not only could I not conceive of such a thing, I wasn’t even sure why anyone would want to. The only tacos I knew growing up in the late ’60s were stale store-bought corn tortilla taco shells filled with a big spoonful of greasy ground beef, garnished with shredded iceberg lettuce and topped with a dab of grated Cheddar cheese and chunks of tomatoes. The taco, a festive version of the North American sandwich, is aromatic, juicy, flavorful, spicy, textured and simple in presentation but complex in flavor. And, suddenly, a door opens and things begin to make sense. Not the gross-out tacos of our youth, then. Rather, a slightly more exotic sandwich, with the potential to suit many tastes and needs. The balance of 300 Best Taco Recipes makes that point and though we begin with “The History and Evolution of Tacos” and “Taco Fillings,” “Toppings” and other literary explorations, most of the book is taken up with recipes and that’s what we’re here for. We begin, of course, with several recipes for flour and corn tortillas. 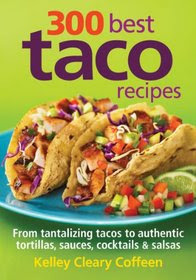 And then the tacos themselves, with recipes suitable for every taste and meal of the day. A few favorites (although, remember: there are 300 of them! ): Grilled Jerk Chicken Tacos with Hot Pineapple Sauce. Chorizo and Egg Tacos (breakfast, anyone?). Tacos Benedict. Chicken Cordon Bleu Tacos. Peachy Praline Soft Tacos. I could go on, but you get the point: if it can be a taco, it’s here. A very thorough section on Salsas, Relishes and Sauces puts the finish on many of the recipes, plus who can’t use a new salsa recipe… or six? 300 Best Taco Recipes is a terrific book for families looking for new ideas for easy, inexpensive, healthy and delicious meals to add to their repertoire. Busy working parents will find a lot of answers to life’s difficult dinnertime questions right here.